VLCC has launched their new range of sunscreens this year. They range from SPF 20 to 50 and have different variants. 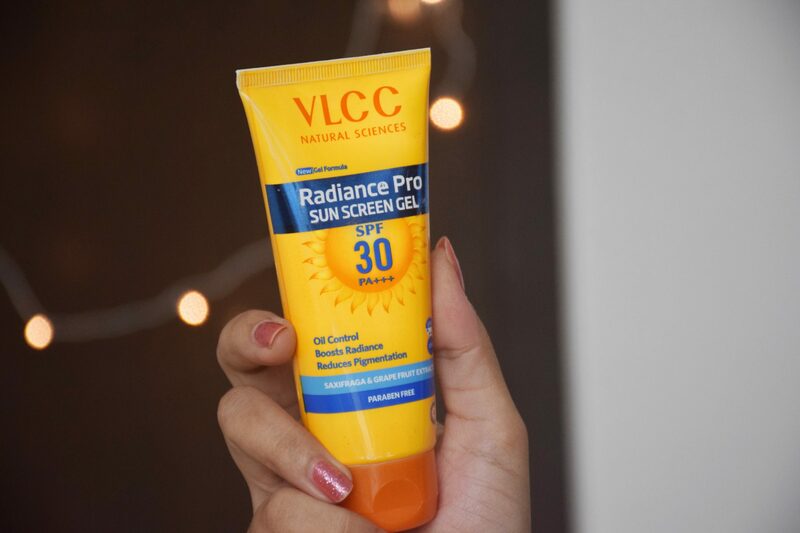 I got VLCC Radiance Pro Sunscreen Gel which has SPF of 30 and PA rating of +++. The sunscreen retails for Rs.350 and we get 100g product. There is also a smaller variant of 50g which retails for Rs.245. VLCC products are available in stores as well as online. I got mine from Nykaa. The brand boasts of Natural science & having used herbal ingredients. 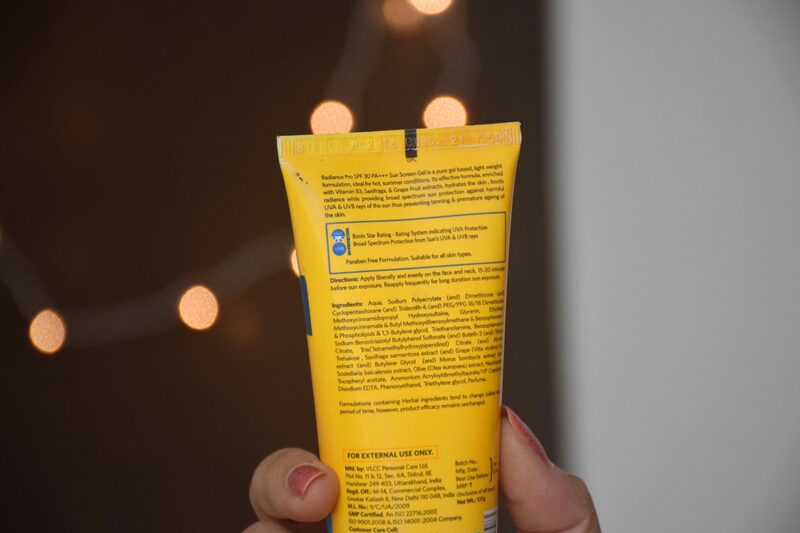 But let me tell you, this is an all chemical sunscreen meaning the UV filters used are chemicals. However, there are a few natural extracts used towards the end of the list. There’s also Niacinamide & Glycerin which attracted my attention and there’s no Oxybenzone ~ a UV filter which is not eco-friendly. Needless to mention, VLCC Radiance Pro Sunscreen Gel is free from Parabens. The texture of VLCC Radiance Pro Sunscreen Gel is milky gel-like which with a creamy tint. It smells somewhat like Lotus Sunscreen gel and has a similar consistency. The sunscreen gel is very hydrating and doesn’t feel silicone-y. 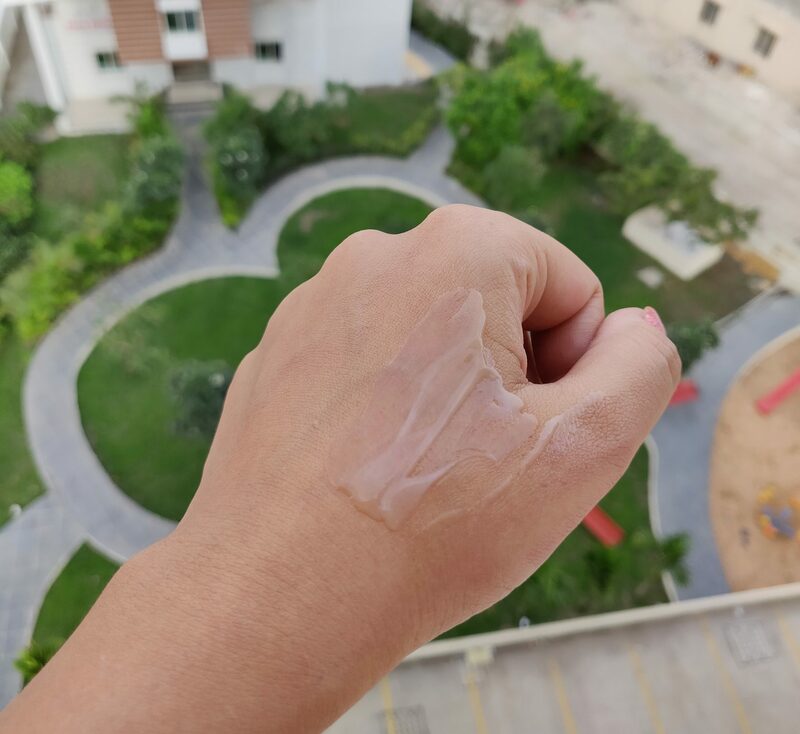 The gel applies easily and gets absorbed quickly into the skin. It does impart some shine initially but it gets disappeared in some time. It gives a matte but hydrated finish. There are times when I have just applied this on my face (skipped moisturizer) especially on holidays when I am not going to put any makeup on top of it. I have almost finished half the tube and so far the chemical filters neither have irritated my skin nor caused breakouts. It protects the skin from UV rays and prevents tanning. 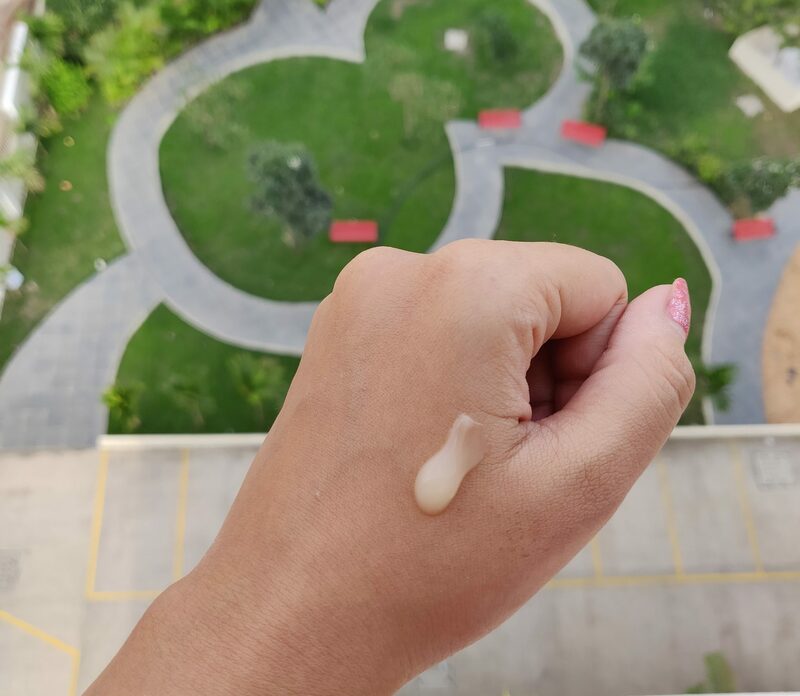 My travelling time under the sun is hardly 5 minutes and for the rest of the day I stay in my office, hence I don’t reapply this but keep topping with Lakme sunscreen compact. I am not sure about boosting radiance and reducing pigmentation but this definitely imparts a healthy glow. And oil control? Ummm No! 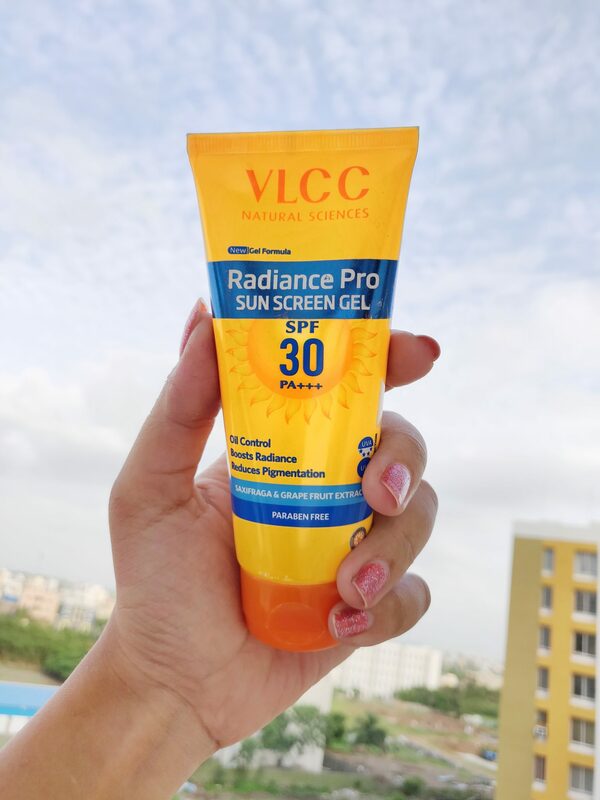 VLCC Radiance Pro Sunscreen Gel is really a good option to consider if you are looking for an affordable & effective sunscreen in the market that will suit probably all skin types. I am excited to try the other variants in this range. Which one should I pick up next? Sounds like a quality product! It is!! What’s your go-to sunscreen these days?? Thank you so much my dear!! Have you tried this yet?? Awesome!! Would love to know your thoughts on that one.. This looks so light weight and nice! And hydrating at the same time!! I have used this in very humid climate and yet it sat wonderfully on my face..
You’ll love this!! Especially during this cold weather..
Looks like a must try chemical sunscreen. Will consider this once I finish my current one! Do let me know how you like it!! Btw, which sunscreen are you using at present?? This one looks so lught weight…vlcc never worked for me in past..but i would love to pick this one up.. It can be used for all skin types I myself have oily skin and it works great for me.